Injustice 2 is just a week old, but competition is already heating up thanks to Deadshot’s frustrating zoning gameplay. After losing to the character during a recent tournament, one player gave his controller a good bounce. As competition wound down on Saturday at the Toryuken tournament in Toronto, paths to the finals bracket became valuable commodities, and one of the last openings came down to a match between two local competitors. Ontario-based players Doctor Stabs and RedThrills were both on the verge of making it to the finals when they faced off. The match was exciting. 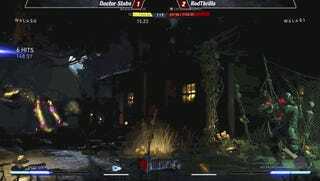 Surprising the commentators by picking Injustice 2 boss character Brainiac instead of his usual Joker or Green Lantern, Doctor Stabs looked to control the fight against RedThrills’ Deadshot until a controller malfunction stole his momentum. From there, it was all Deadshot. As we noted previously, Deadshot is a frustrating character due to his ability to completely demolish opponents without ever having to approach them. His wide variety of projectiles makes fighting him an exercise in patient, careful gameplay, and even when a player manages to close the gap, the assassin is capable of controlling the match with mixups that make blocking a complete guessing game. It’s these traits that led to Doctor Stabs physical outburst after he eventually lost to RedThrills by a score of 3-1. Fighting games can be frustrating, doubly so when competition enters the equation. Sometimes that frustration manifests itself in the real world. These displays rapidly become meme fodder for the fighting game community. Sanford Kelly, a skilled east coast competitor, even saw his particular arcade stick slam (shown below) become a Kirby Super Star-esque minigame. Fortunately, in both instances, no one was hurt (if you don’t count the broken controllers, of course). The moment was so popular that even his opponent, Jonathan “Rico Suave” DeLeon, became a running gag thanks to the snarky thumbs up he flashed at the camera after witnessing Sanford’s frustration. While sights such as these are uncommon, it comes as no surprise that a genre built around removing as much agency from a person during competition as possible can result in these reactions. And eliciting these emotions from the player sitting next to you can often be a greater achievement than actually winning the match.